“Pre-Approved” for a Mortgage Beats Just “Pre-Qualified”! 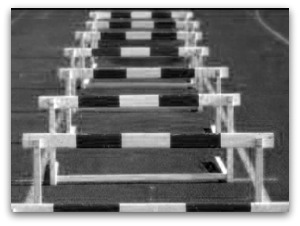 Getting a mortgage approved in today’s real estate market is similar to running an obstacle course….blindfolded. That’s why potential home buyers need to chart out a path that leads to a successful purchase negotiation and closing. Many of the properties hitting the market in greater Cincinnati are sold within a week or so and unprepared buyers are running into numerous obstacles that need to be jumped before they even began actually looking at homes or condos to buy. Take the time to secure a “pre-approval” not a “pre-qualified” letter from your lender to present with you purchase offer. What’s the difference between “pre-approval” and “pre-qualified”? The simplest way to define the difference -pre-qaulified for a mortgage doesn’t mean you’ll get one- but a pre-approval letter vastly improves your chances to obtain a mortage. Why? To obtain a pre-qualification letter your loan officer or lender should pull credit report, discuss employment, review assets and income and may complete the paperwork to submit to an automated underwriting system. But loan officers don’t approve loans because that job fall to a group call the underwriters. The underwriters look at the total package for the loan and determine whether it meets all of the lender’s guidelines before approving the loan. And because no one has really scrutinized the details of the potential loan the letter of pre-qualification is issued and when you submit a copy with your purchase contract savvy sellers and their agents know the real value of pre-qualification. Just pre-qualified buyers are competing with buyers who jumped over several more obstacles to complete the process required to obtain a “pre-approved letter” from their lender. These buyers have gone through the first pass of the underwriting process and are usually rewarded with a letter specifying type of loan (FHA, Conventional) conditions (usually purchase contract, satisfactory appraisal and additional criteria as well as an expiration date. The letter is usually good for 120 days- so a buyer needs to buy sooner rather than later. Most pre-approval letters do not specify a loan amount or the amount a buyer can borrow since this would impact the buyer’s ability to negotiate. Most purchase contracts require an updated letter within a short time frame in which the lender verifies the borrower can borrow enough money to complete the purchase. The push to provide a detailed pre-approval from the lender doesn’t mean the loan is a slam dunk -but it does provide sellers with the knowledge that the first obstacles were cleared and chances are good the deal will close. Unfortunately no industry standards exist for either type of letter and it would be helpful if the actual letters would state (and some do) that an underwriter has reviewed and given conditional approval. If you’re unsure what type of letter your lender provides push for a detailed description and discuss with your agent. Lots of buyers think they don’t need to bother with a lender until they have home under contract- but put yourself in the seller’s shoes and think which purchase offer is more appealing? The contract from a pre-approved buyer or something else?